Overcooked is a game truly revolutionary created at a time in history where you have to have a lot of imagination, because your game being noticed. It was created by a team of two developers, and is a simulator of the kitchen as simple as it is dynamic and action-packed. 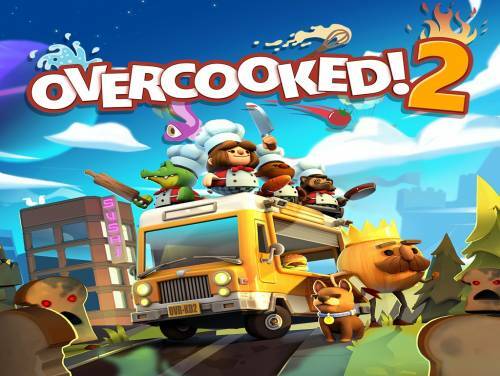 The game, created in 2016, has been so successful that it has been created a sequel, Overcooked 2, containing, in summary, what in the first chapter was missing: a new multiplayer mode, new recipes and cuisines. The King of Onions is again in danger. An army of bread revived the threat is real and only a team of expert cooks will be able to satisfy their incredible hunger. You'll have to travel through the many kitchens all over the realm, refine your knowledge of the culinary and prepare for the final challenge. OK, not the best as the plot, but it is not the type of game that offers a narrative immersive. Should be rather appreciated for the style of game fun and dynamic. The mechanics of the game of Overcooked 2 is the same as that of its predecessor. Playing alone, or in 4, you have to prepare a list of dishes ever-growing at the speed of light. The requests are very simple at the beginning, such as vegetables and soup base, then progress to pizzas, sandwiches, sushi, and other dishes with ingredients multiple. You'll have to coordinarvi with your friends as chefs to be able to fulfill all orders, and the beauty comes when you make some mistake: this is done the order wrong or the kitchen is on fire. Have been added to many dynamic elements such as balloons, air, kitchens theme, in the ice, in lava, in space), and even kitchens the dynamicsthat develop or change during the course of the level. You can also play with various Chefs, whether human or animal. It is not possible I was completely customise the cook, but you will have to choose between avatar ready. The online mode is an innovation of the second chapter of Overcooked. The players vote to choose the kitchen and start to play with the ability to communicate between them. If you do not have a microphone you can use the emote created specifically to communicate effectively with the rest of the team. In short, Overcooked 2 is a worthy successor to the first, although the mechanics of the game remained the same. The new additions, the new scenarios will certainly make the game interesting, the only flaw is that it could be boring for those who played the entire first chapter, dive in the same soup, for the second time. We recommend that you buy the game only if you have not played the first or if you were struck by it and want to try again the same experience, improved. Check All the news regarding Overcooked 2 currently inside our archive of videogames news.